1 October: “A Pilgrimage for inner beauty”. H.S.H. 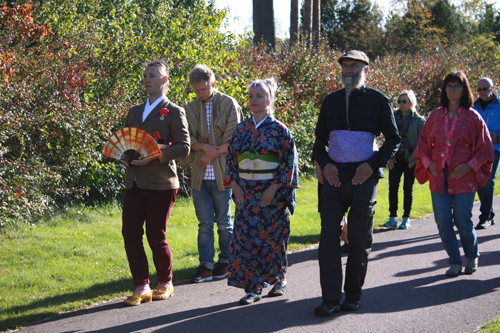 Prince Freï, the choreographer and Baroness Lady Amy Skånberg Dahlstedt and the University Church of the University of Karlstad invited citizens to participate in a one-day pilgrimage in Lorenzburg. During the walk the pilgrims travelled 350 metres in 1,5 hours. The group explored the slow stylized walking style “Suriashi” that forms the foundation of Japanese stage, and martial, arts. Lady Ami was awarded the Order of the Flame of Lorenzburg after the walk. After the pilgrimage the participants was invited for coffee and informal chatting by the “Seal of Secrets” nearby. Below you can see the documentation of the walk. The video begins with a 15 minute introduction in Swedish.